Scenario: From the novel of the same name by Charles Dickens. 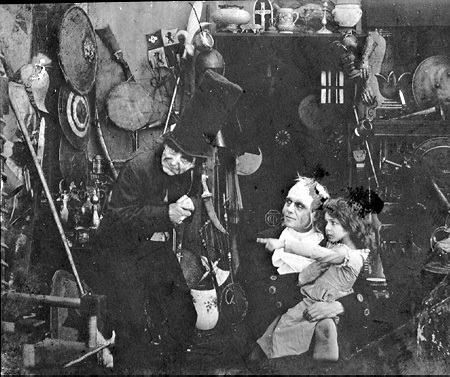 BACKGROUND OF THE SCENARIO: Charles Dickens (1812-1870) was born the second of six children to an English Naval Pay Office clerk and lived a happy childhood until his father's confinement in the Marshalsea prison for debt, upon which Dickens began another life, almost in a different world, this one impoverished. At the age of 12, Dickens went to work for six shillings per week labeling bottles in a blacking warehouse, an experience that would later inspire the early chapters of David Copperfield and the suffering sustained by the title character. He worked later as an office boy, a shorthand student, and then, at age 20, as a reporter of House of Commons debates. In 1833, Dickens began contributing to magazines of his day, after which his success (under the name "Boz") slowly but steadily grew to significant recognition. When he was 25, his Pickwick Papers were published, increasing his recognition. Shortly after the death of his close friend and sister-in-law Mary in 1837, Oliver Twist appeared in installments, followed soon thereafter by Nicholas Nickleby. In 1840 Dickens began the publication in parts of Master Humphrey's Clock, in which appeared short sketches as well as the beginnings of two novels, The Old Curiosity Shop and Barnaby Rudge, which achieved popularity. In 1842 Dickens was received warmly during a visit to America, only to return to England and write disparaging things about the United States in his American Notes. The many fine things which he presumably saw were overlooked in an effort to concentrate upon and amplify various difficulties and unfortunate social conditions he observed. The result was a lopsided view which contrasts sharply with other journals of the era, and which earned him the enmity of his former hosts. His novel, Martin Chuzzlewit, also employed American material. His popularity was further tainted by the publication of his views on the need for an international copyright and the abolition of slavery, neither of which philosophies were popular in certain quarters. Christmas Carol, the immortal tale of Scrooge, restored his bank balance, although it did not live up to his full financial expectations. In 1849 he visited Italy and began to contribute to the radical newspaper Daily News. His return to England in 1850 was followed by 11 years of great success, including the novel, David Copperfield (of which Dickens later said "I like this the best"), in 1849-1850, A Tale of Two Cities in 1854, Little Dorrit in 1855-1857, and Great Expectations in 1860-1861. These years were also marked by a prosperous family and a large circle of friends. In 1858 Dickens and his wife separated. In the meantime his interest had been drawn toward the young actress Ellen Ternan. Dickens revisited the United States in 1867, then returned a year later, and in 1870 suddenly died in England, leaving behind a legacy of 15 major novels, countless articles and short pieces, and the half-completed manuscript for The Mystery of Edwin Drood. Dickens' interment was in Westminster Abbey. A century later, his reputation was undimmed, and he is generally considered the greatest Victorian novelist. 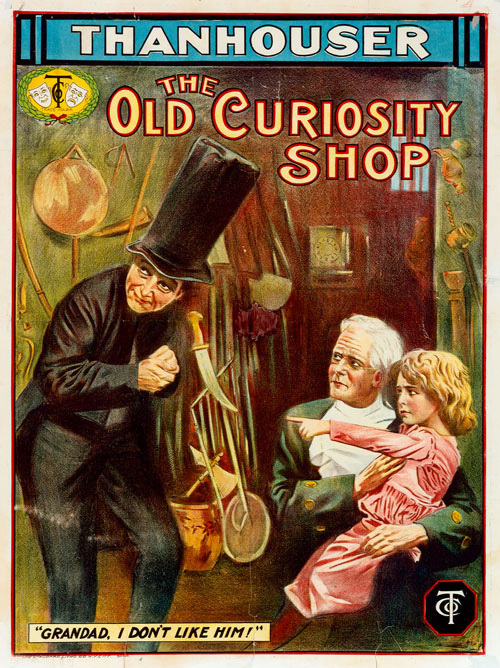 The Old Curiosity Shop, first published in installments in 1840 and 1841, is the story of Little Nell Trent and her grandfather, who are chased out of their shop and about the country by a mad deformed dwarf named Quilp, who is in pursuit of the money the grandfather borrowed and lost gambling. Soon the grandfather's brother returns from abroad with the ability to help, but cannot trace the two until after the death of Little Nell, followed closely by the grandfather's demise. The death of Little Nell was, for its use of pathos, one of the most celebrated scenes in literature in Dickens' day. The story, like most penned by Dickens, also had a great number of minor characters of a colorful nature, who collectively played a large role in the story. "An old man, keeper of a quaint curiosity shop in London, lavishes all his love upon his granddaughter, Little Nell, the only person in the world for whom he really cares and who really cares for him. Poverty galls him, not because of himself, as his tastes are simple, but because he wishes to see Nell surrounded by every luxury. And he finally believes he has found a way to make her wealthy. His few acquaintances wonder what it is, for he talks mysteriously yet happily of his plan, but his secret is only found out by accident. He is gambling, always with his darling's name upon his lips, for he cannot see how the blind Goddess can withhold her favors from one so lovable as little Nell. "But the result of his gambling is the usual; the man loses all, and is finally left without a cent that he can call his own. Nell, who has heard of his folly, fears that her grandfather will be taken away from her and placed in an asylum, and flees with him in the night. They have no money and no destination; fear drives them along. Mrs. Jarley, the kindhearted proprietor of a waxwork show, befriends and shelters them, and for a time it seems that their troubles are over. But the old fascination holds the old man. He robs his granddaughter of the tiny amount of money she had, and gambles it away, hoping to return it tenfold. He loses, of course. Then the men who have robbed the helpless old man, urge him to steal from his benefactress. He finally consents but is saved from that crime by little Nell, who sees that the only way to save him is to fly with him from temptation. So the feeble old man and the delicate child become wanderers again. When Nell's strength is exhausted she meets a kindly schoolmaster and appeals to him for aid. Then she falls unconscious at his feet. The schoolmaster, although poor himself, takes the pair to his own home. But it is too late to save Nell. Wanderings and privations have snapped her vitality, and she dies. Her grandfather, brokenhearted, is found lifeless on her grave a few days later. The lesson that Dickens teaches in this story is that gambling does not pay, even when conducted for the best and most noble of purposes." "This reel devotes itself to the portraying of a number of the beginning chapters of Dickens' well-liked novel. The story of Little Nell and her faithful granddad is depicted in a manner very true to the atmosphere which Dickens instilled into this touching story. The film has two very commendable features; one that it is educational from the literary viewpoint, secondly that nothing is overdrawn but all distinctly natural, which bespeaks praise for the actors. The standard of Thanhouser photography was well preserved." "To a lover of Dickens a pure delight. The salient points of the story have been taken and thus the film moves along so as to forge an intelligent conception of the original. Needless to say, the immortal little Nell is acted by the charming Thanhouser child, with the pure childishness that is altogether tenderly true. The byplay of this little one shows a grasp of the character simply marvelous. Of course, one misses the atmosphere when the scenes are in the open; the old hedge-lined lane where little Nell and her grandfather wandered, and the square, embattled, ivy-clad tower crowning God's acre where the grandfather joined his guardian angel. The condensation has been thoughtfully done, by one who evidently knows the possibilities and limitations of the reel. A worthy production that must needs win its reward." REVIEW, The New York Dramatic Mirror, January 25, 1911: This review is reprinted in the narrative section of the present work.